It was a most demanding Course, mostly consisting of taking off up to 100ft or so, at which point the instructor pulled a Screen over the Trainee’s side of the Cockpit blacking out everything. From then on flying was by Instruments only, guided by the Radio Beam System until on the Final Stage of the Approach for Landing, when the Instructor then removed the Screen. The Beam Approach (sometimes known as Blind Approach) system relied on 2 audible Signals, Morse A (dit dah) and N (dah dit) which originated from differing parts of the Airfield, which was “divided” into 4 Quadrants. Listening to the Signals, the Pilot knew which side of the Airfield he was flying in from. When he started hearing both Signals of different strengths, he was aware of how close to the Centreline he was. When both Signals merged and became a continuous sound, he knew he was “on the beam“. Ancillary Signals enabled the Pilot to land in very poor conditions. This is a huge simplification of what was, in fact, a complicated set of learned instructions involving many changes of Direction & Height as well as swift calculations of Orientation in response to the audible Signals you were receiving. The Beam Approach System was a relatively new Technology in 1942 and was still very much under development. The idea was to guide tired and often injured Crews to land safely in the dark or in reduced visibility such as Fog. During this time, Upavon became a Flying Training School. 1537 BAT Flight (Airspeed Oxfords). The Beam Approach System would be installed only on the Main Runway with 2 Main Beacons (inner & outer) which transmitted Signals to a Receiver set in the Aircraft. A fixed narrow Radio beam gave out a continuous tone Signal when the Aircraft was correctly in line with the Runway, to the Left of approach dots would be heard and to the Right and dashes were heard on either side when flying Offline. The Pilot had to keep the Aircraft flying along the line of the continuous Tone (Riding the Beam) until he reached the Airfield and was able to land. Once within 10 or 15 miles of the Aerodrome, the Beam Approach System was turned on and the Guidance System would begin. SFTS Instructor and Qualified as SBA (Standard Beam Approach) Instructor 13th March 1942. RAF Little Rissington was situated just outside Bourton-on-the-Water perched at the top of the Hill it was 730ft above Sea level. Little Rissington (known to all as Little Rissi) 15 miles east of Cheltenham opened in 1938 as a grass strip and had 3 Runways added. It had 4 ‘C’ type Hangers 152′ wide x 300′ long & 35′ high steel doors. RAF Little Rissington officially opened in 1938, comprising the domestic site and a grass Airfield. During 1942, 3 asphalt Runways were laid. 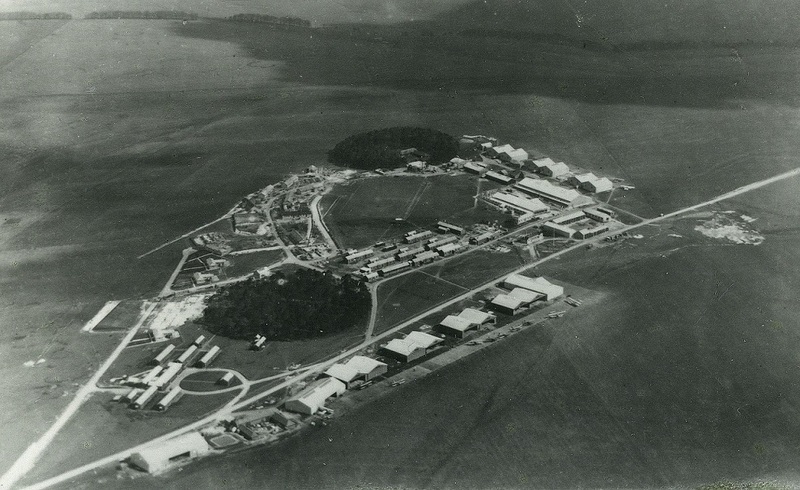 Extra land was added to Accommodate Sites A to E. Later in the War, the main Runway 05/23 was extended Northerly (later to become the Main Runway for Instrument Landings), 09/27 & 14/32 were extended Easterly & South-easterly respectively. Windrush 4 miles South was a Satellite of Little Rissington. Crashed off Cahore Point, Wexford, Ireland. Crew – The Lockheed Hudson Aircraft crashed at Sea off Cahore Point in terrible weather conditions. Only Rostern & Beard’s bodies were recovered by a nearby Trawler. Rostern & Beard are buried in Arklow, Ireland. 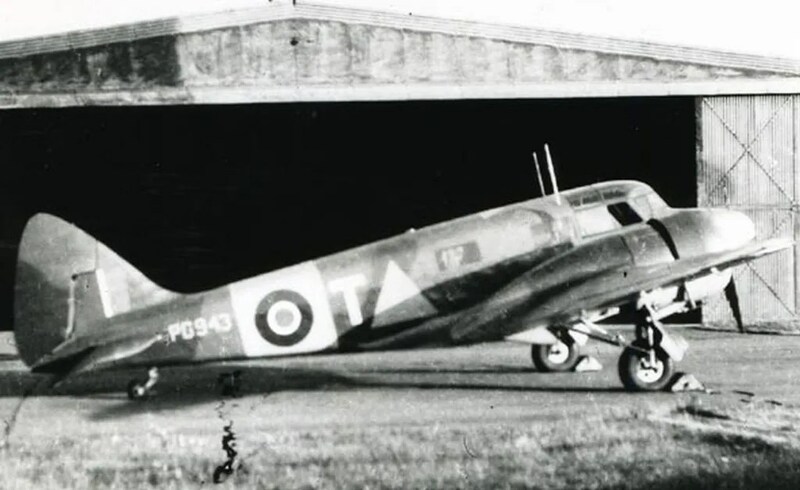 Airspeed Oxford – a wood and fabric Twin Engine low wing monoplane with mostly very benign characteristics. 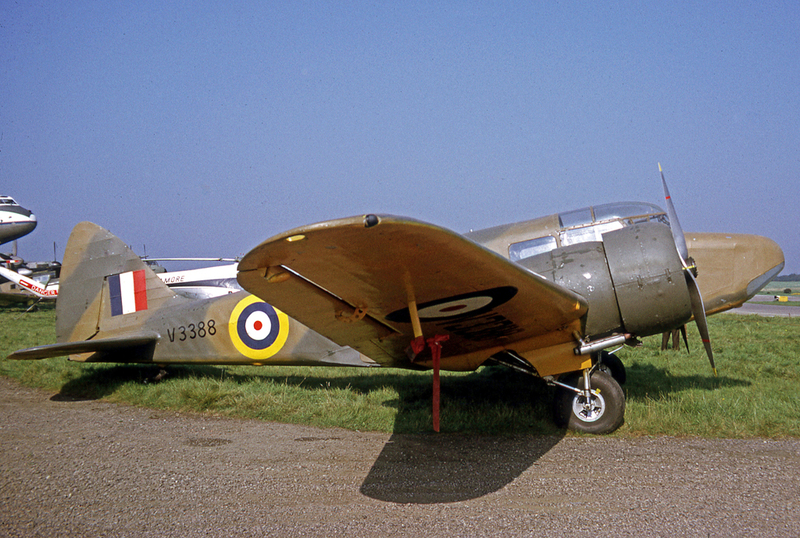 Oxford II Armstrong Siddeley Cheetah X engines Inertial started – hand cranked Oxford V Pratt & Whitney Wasp Junior Engines Started with an External Generator. Probably for Security reasons, Aircrew Members selected for Training at Nassau in the Bahamas had no prior warning of being sent there, they were sent off to an undisclosed destination to eventually find themselves crossing the Atlantic in a Troopship, to Halifax, Nova Scotia or New York followed by a long train journey South & Sailing over to the Bahamas on the 640 ton ‘Jean Brillant‘ from Miami to Nassau. A L J Craig was appointed as a Flight Lieutenant (Permanent) with effect from 1 September 1942. The RAF Reserves Club, which was started in 1946 for serving and ex-members of the RFC, the RAFVR, & the RAuxAF, is continuing to “Lodge” at the RNVR Clubhouse at 38, Hill Street, Berkeley Square, pending Acquisition of its own premises. By arrangement with the RNVR Club, all Reserve Club Members are given the full facilities of the Clubhouse, which include the use of all rooms and Residential Accommodation. For Town Members, the Annual Subscription is 2 Guineas, and for Country Members 1 Guinea. The Membership year ran from July, and Applications for Membership were addressed to the Secretary, RAF Reserves Club, 38, Hill Street, London, W.1. – Private Members Club in a beautiful 18th century Georgian house designated as a War Memorial to those members of the RNVR who lost their lives in 2 World Wars. Alas depleted like the Pathfinder’s Club and now a Naval Club. A classic London Townhouse, built in the early 18th century as part of the exclusive new Mayfair Development. At that time, the house included Outbuildings and Stables in Waverton Street. One of the 1st Occupants of the House was the Earl of Chatham, brother of William Pitt the Younger. In the 19th century, the Building was enlarged at the rear to form a fine new Dining Room. This Room, now the Ground Floor Bar, contains fine examples of Victorian Panelling, Mouldings and Carvings. The Building was subsequently acquired by the Raphael Family and remained in Private Ownership until WW2 when it was requisitioned for use by the Auxiliary Territorial Service, as the Women’s Arm of the British Army was then known. As early as 1943, Royal Naval Volunteer Reserve (RNVR) Officers serving in nearby Whitehall had an aspiration to keep in touch with one another when the War was over. They formed the RNVR Officers’ Association and purchased the Freehold of 38 Hill Street in 1946, and it has been the home of the Association and The Naval Club ever since. In June 1954, 38 Hill Street was dedicated as a War Memorial to the RNVR and houses the Roll of Honour of all RNVR Officers and Ratings who died in the Service of their Country. The RNVR was 1st formed in 1873 and provided continuous Service to the country from 1903 to 1958 when it was unified with Merchant Navy Officers willing to volunteer to form the Royal Naval Reserve. On 22nd November 2000, His Royal Highness the Duke of Edinburgh unveiled the RNVR Roll of Honour which lists all Naval Volunteer Reserves who died, including those of the Dominions and Commonwealth. In 1987, the house was listed as a Grade II building with particular reference to the Grand Staircase with its ornate balustrade decor and wrought ironwork, and the 1st floor Louis XVI style Dining Room.